If you are installing a wood burning stove, boiler or gas appliance and you are planning to run your flue system either through a wall, a floor or externally you will need to use a twin wall flue system. Twin wall flue pipe has a 1 inch layer of insulation around the pipe. Accordingly, the external diameter of twin wall pipe is always two inches larger than the internal diameter, which is the diameter it is quoted in. This is because the internal diameter is the crucial figure when designing a wood burning stove flue system but you should always be aware of this as, for instance, if you purchase a 5 inch diameter twin wall pipe the external diameter will be 7 inches – a big difference if you were not expecting this! 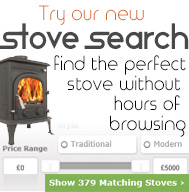 You will always need at least one length of single wall enamelled stove pipe as you cannot connect your twin wall pipe directly to your wood burning stove’s flue outlet. You can then use single wall pipe internally, it is recomended that you do not go more than 1.5 meters before changing to twin wall but you certainly need to convert at least 4 inches before passing through a wall or floor. You should use an adaptor to single wall to allow you to convert to twin wall flue pipe and then once you have converted you must continue the flue system in twin wall. When passing through a wall you must always go at a maximum angle of 45 degree (you shouldn’t use 90 degree bends in wood burning stove flue systems) and use a wall sleeve to protect your wall. You can finish the job off with finishing plates. If you are passing through an internal floor you will need to use firestop plates and remain at least 50mm away from combustable materials like joists. When passing through a roof, you should use flashing and a storm collar to seal the joint – you should use high temperature flashing if you are less than 5 meters away from your stove. At Glowing Embers we can provide you with a wealth of experience and advice when planning your twin wall system or installing a wood burning stove, you can either call or email us and we would be pleased to assist you further.